Directions: If you have never been licensed, you will be given a knowledge test to determine how well you know Michigan traffic laws and safe driving practices. Applicants age 18 or older will be given this test at the Secretary of State office when applying for a Temporary Instruction Permit. If you have a valid driver’s license from another state, the written knowledge and driving skills tests as well as the 30-day practice requirements may be waived. The Department of State will contact your previous home state to obtain your driving record, which then becomes part of your Michigan driving record. There are 50 questions on the written test. You have to score 80% and above to pass. All questions are taken from the Michigan Drive License Manual. Please thoroughly study the manual before taking the test. Staring at the roadway for long periods of time. Too much sleep the night before your trip. "Highway hypnosis” happens when you stare straight ahead at the roadway for long periods of time and stop actively scanning ahead, behind, and around your vehicle. This can lead you to zone out, making you very likely to crash into traffic slowing or stopping ahead of you. The more distance between your vehicle and others, the more time you have to react to possible hazards. Keep a minimum following distance of three to four seconds during normal weather and traffic conditions. Increase your following distance during unusual weather or traffic conditions. What should you be most concerned about when you see this sign? Driving with your headlights out of alignment because one side of your car is higher than the other. Damaging a tire from drifting onto the shoulder. Hydroplaning, if the shoulder has water on it. Losing control of the vehicle if you drift onto the shoulder. 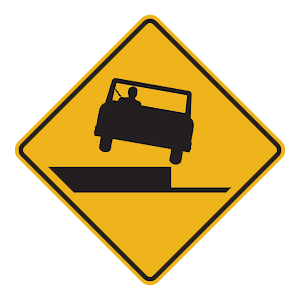 This sign indicates that the shoulder is lower than the road in the area ahead. If you drift off of the roadway and one wheel drops onto a low shoulder, do not slam on the brakes or steer sharply to try to get back onto the roadway. This could easily cause you to lose control of your vehicle. 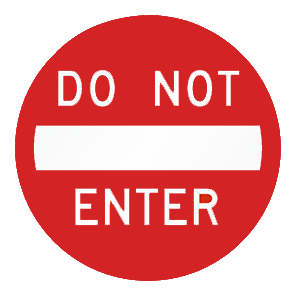 This sign is placed at the beginning of one-way streets and ramps to indicate that you must not continue driving in your current direction. Pentagonal signs indicate that you are in a school zone. Be extra alert to children and pedestrians when driving near a school. Increases the risk of causing a crash. Is no more dangerous than consuming alcohol by itself. Lessens the effect of alcohol on your ability to drive. Has no effect on your general driving ability. Drugs (including illegal, prescription, and over-the-counter medications) can affect your brain function and impair your ability to drive safely. Combining alcohol with other drugs will increase the risk of a crash. The road to the right is for one-way traffic only. That due to upcoming roadwork, detour to the right. Slow down because the road ahead changes direction at an extreme angle. There is a crossroad to your right. 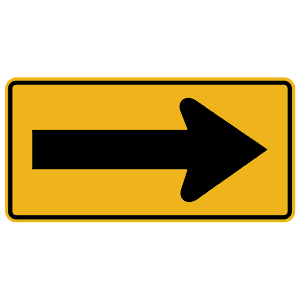 This sign indicates that the road ahead changes direction at an extreme angle (in this case, to the right). Before you reach such an extreme curve, you should slow down as much as you would when making a turn at an intersection.